Carrington onyx and diamond cufflink, circa 1920. Founded in 1900, Carrington & Co. created elegant gold and platinum cufflinks during the first half of the 20th century. In addition to fine cufflinks, the firm was renowned for elegant dress sets, vanity cases, lockets and other jewels. Carrington cufflinks and accessories were retailed by the finest jewelers of the day including Tiffany & Co. and Cartier. 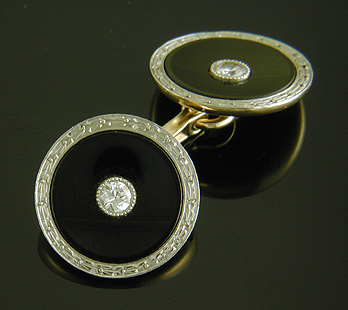 Reverse of Carrington onyx and diamond cufflinks. Although the fronts of antique cufflinks are what first attract us, a careful examination of the backs is rewarding in its own way. The backs often provide clues as to the maker and age of the cufflinks, as well as the quality of the craftsmanship and the purity of the materials. This note focusses on the maker's marks and precious metal indicia found on the cufflinks of Carrington & Co. The Carrington maker’s mark was a squared, angular “C” surrounding "14" or "18" which indicates the purity of the gold. The maker's mark is most often found on the reverse of the cufflinks, although occasionally it is stamped on the side of the cross bar. Although most Carrington cufflinks were created in 14kt gold, every so often you come across a pair that is crafted in 18kt gold. The 18kt pairs may have been special commissions created at the request of a client or retailer. Shirt stud with "C14" mark. In dress sets, the vest buttons were signed like the cufflinks with a squared "C" enclosing a gold purity mark. Shirts studs, because of their small size, were simply signed with a diminutive "C14" or "C18" along the shank. Carrington platinum and gold cufflink, circa 1925. Carrington worked with platinum as well as gold. The firm created beautiful mixed-metal cufflinks with striking platinum borders and richly engraved platinum tops over solid gold backs. The above example features platinum borders with etched mother-of-pearl centers. The backs and linkage are crafted in 14kt yellow gold. In addition to the Carrington maker's mark, the gold and platinum cufflinks are stamped with "GOLD&PLAT." on the reverse. This mixed-metal mark is fairly small and at times can be obscured by wear. This occasionally leads to some confusion. Every so often I receive an inquiry about a pair of cufflinks signed by a mysterious jewelry maker named "GOLDSPLAT". At other times I am asked about cufflinks signed with a "C" and "14" and marked "GOLD PLATED". Needless to say, the Goldsplat signature is a misreading of the gold and platinum mark and, to the best of my knowledge, Carrington & Co. never created gold plated cufflinks. 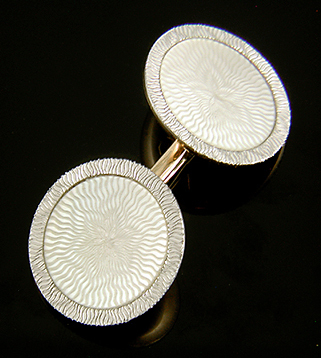 Carrington platinum cufflinks, circa 1920. Last, but not least, are the all platinum cufflinks. One of the more desired rarities in the world of antique cufflinks are the beautifully engraved platinum cuff jewels created by Carrington & Co. in limited numbers during the 1920s. The above photograph illustrates a mesmerizing example. The Carrington solid platinum cufflinks are simply marked "PLATINUM". There are no squared "C"s or other marks indicating that the cufflinks were created by Carrington & Co. The cufflinks are attributed to Carrington based on the quality of the craftsmanship, the pattern of the engraving, and the design of the brackets and linkage. Like the 18kt gold cufflinks, the solid platinum cufflinks may have only been created as special commissions when requested by a client or retailer. Carrington cufflinks in the Retro style, circa 1950. For half a century Carrington & Co. created fine cufflinks and dress sets. During most of this period the Carrington maker's mark and precious metal marks remained unchanged. However, in the years following World War II the marks were modified. In this period, Carrington was creating cufflinks in a heavier, bolder style that in recent years has come to be known as "Retro". These glittering examples of mid-century modernism were signed with the amended mark. The new mark features an elongated, less boxy "C" with "14K" appended to the right. What prompted this change, perhaps to make the gold purity more explicit or to comply with a regulatory change, is unknown. The new mark appears to have been limited to cufflinks crafted in 14kt. I have not come across a pair of 18kt gold cufflinks similarly marked. The new mark appears to have been used from the mid 1940s until the firm's closure around 1950. The later Carrington mark is sometimes confused with the similar mark of another early 20th century cufflink maker, Charles Keller & Company. Charles Keller & Co. was a prolific maker of gold and platinum cufflinks from 1885 to about 1930. The Keller maker's mark, shown above, is a rounded "C" enclosing the gold purity followed by a "K". Here the "K" does double duty as the initial for both karat and Keller. At times Keller cufflinks have been misidentified as the work of Carrington. Because Keller cufflinks can be less valuable, it pays to know your marks. can be found in the Antique Cufflink Gallery. Recent additions to the Antique Cufflink Gallery have an architectural theme. They include a striking pair of Gothic Revival cufflinks with blue sapphires and elegant two-tone cufflinks with intricate arabesque designs. In the Antique Stickpin Gallery recent additions include a glowing angel skin coral stickpin created by Hans Brassler.